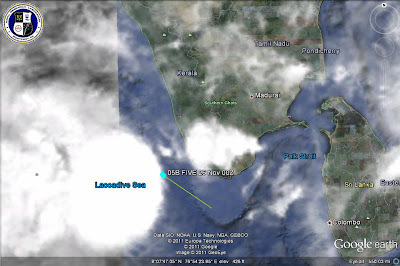 Already numbered as 05A, the system is at 8.2N and 76E, about 200 kms due South of Cochin. Thus having moved N, system, now a depression, though I would put it at deep depression strength, with a core pressure at 996 mb and 35 knts winds. It is expected to storm into the Lakshdweep seas Saturday. Very heavy rains in the islands and Kerala this week end. AS-4 is forming like a monsoon system, with deep convective mass to the North of the system and heavy precipitating heavy rains in its Northern peripherial areas. No change in the Forecast path and rain estimate regions as per vagaries map below (maintained).Now almost all models tow the NW track line (shown initially by Vagaries), it is shown as going North by avoiding Oman , and heading for Pakistan coastline. Vagaries' estmate remains to the track shown in the map earlier (reproduced below). However, Vagaries maintains at "fizzle out" or, at the most weaken, after Tuesday,29th. I feel AS-4 can wear out as a system, and its pressure will rise. But, the residual precipitation can remain in the region. If a W.D. is crossing the Northern regions around the same time, then, clouds from the remnants of AS-4 can spread NE into Pakistan. 7.4N and 76.5E, about 250 kms due South of Cochin. Thus having moved NW, system, now a well marked low, with a core pressure at 1001 mb and 30 knts winds. It is expected to storm into the Lakshdweep seas on Saturday. 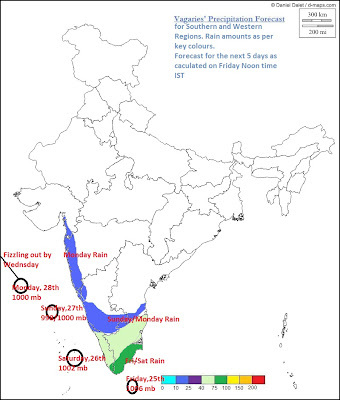 Very heavy rains in the islands and Kerala this week end. Forecast path as per vagaries map below (maintained). Next update and forecast review at 12 noon IST Saturday. The UAC has descended to sea level, and is at 4N and 79E, has moved NW. Core pressure at 1004 mb and 15 knts winds. I have seen that the Bay of Bengal has its Southern limit at 5N, hence this system has not formed in the Bay. As it will traverse majorly in the Arabian Sea, we shall number it AS-4, when it is matured. The forecasted rain in T.N. has been widespread, with Cuddalore receiving 140 mms,Karaikal 100 mms and Nagapattinum 99 mms. Many other stations received between 40 -70 mms. Chennai too got heavy rains,with Meenanbakam seeing 98 mms and Nungambakkam 65 mms. NE winds late last night peaked 46 kmph during a thunderstorm.Thunderstorms are active in the city on Friday morning. Observing the current parameters, Movement expected along the track predicted by Vagaries in the Map above. Monday,28th: Cloudy. Light rain in some parts of the city. 30c - 25c. 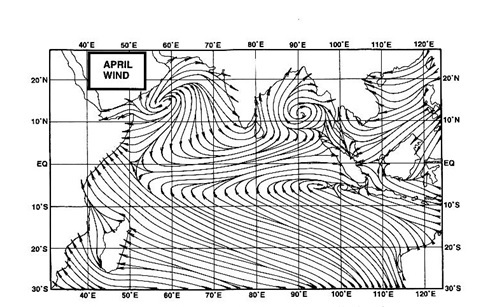 Observe, that the " wintry" trend in Mumbai, however mild, will take a back seat now for a few days ! 1. the system moving N/NW after initially and then NW. Roughly after 15N it steers NW. 2. Mumbai region (Konkan) is shown in the 10-25 mms colour range. 3.I do not know what BBC is showing ,as I have not seen that...but I can show you what "vagaries" is estimating. Sridhar: 3 days ago you had asked me why only vagaries is showing NW movement, and all others are forecasting Northwards.Well,I think, others are changing their forecast now ? PWP:yes, more active, almost monsoon like..do you feel AS-4 will move North as shown by models ? Rajesh can we expect rains in KHI due to this tropical storm?